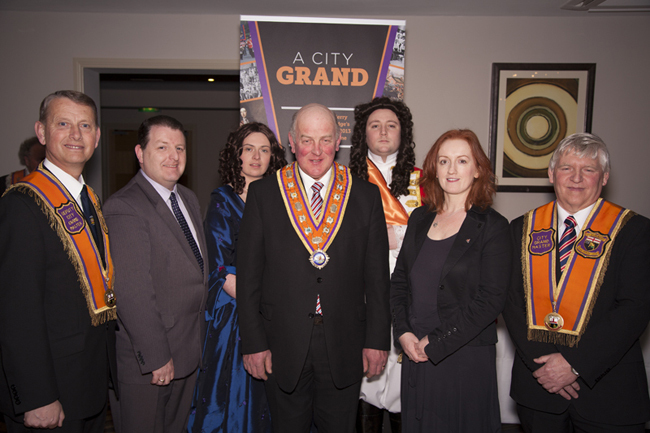 The City of Londonderry Grand Orange Lodge has revealed its forthcoming programme of free cultural events being planned as part of the UK City of Culture celebrations. Entitled A City Grand, the programme incorporates a variety of elements from art, education and community relations with the aim of attracting a wide and diverse audience. A City Grand will include a touring drama production, art exhibition, lecture series and family day, alongside the traditional events in July. A City Grand will kick off next month with theatre-in-education drama production The Billie Girl by Jonathan Burgess. The play, which is aimed at Key Stage 2 primary school children, will tour the city’s primary schools until the end of May and explain the origins and motivations of the Orange Order. It will then be re-staged at the Waterside Theatre on Thursday 13 June in a special performance for the general public, followed by a live set from Northern Irish folk rock group Sontas – this evening will have a nominal entry charge of £5. Other events in June include a series of four lectures that will take place in venues throughout the city and look at different aspects of the Orange Order’s history and culture.An art exhibition will run in the Playhouse Gallery 4– 7 June where the general public will be given a chance to get a behind the scenes glimpse at how traditional orange banners and regalia are produced. Local artists Willie Magowan and Wilson Sherrard will be creating the collarettes and new hand painted banner, which will commemorate the city’s UK City of Culture status in 2013, and will be paraded and dedicated at the annual City of Londonderry Grand Orange Service to be held in St. Columb’s Cathedral on 7 July. There is fun for all the family on Saturday 8 June at the Festival Day at Wilton Park where living history characters, a bandstand and bouncy castles will be just some of the treats on offer. The programme of events will come to a grand end on 12 July when the local celebrations marking the 323rd Anniversary of the Battle of the Boyne are held in Londonderry, with the Grand Masters of England, Ireland and Scotland all in attendance.